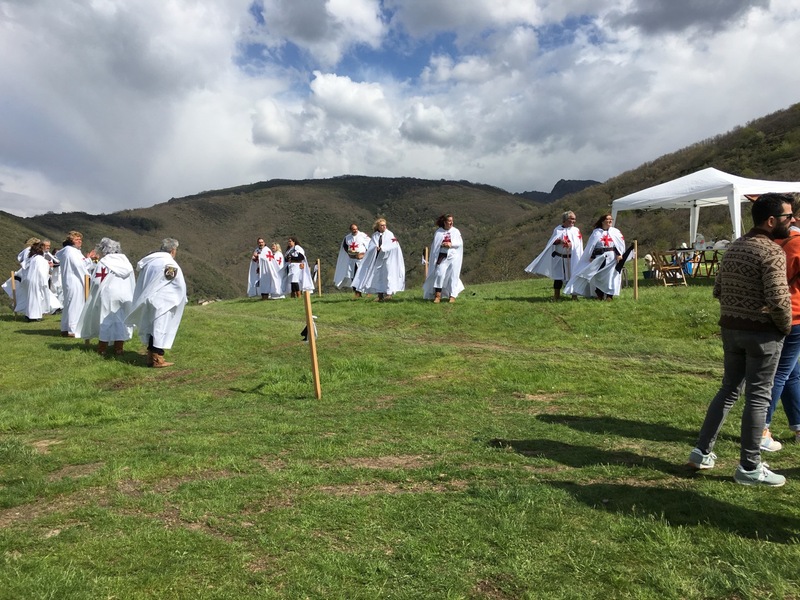 Here are some photos from a race in the Aquiliano Mountains behind our house. You can click here to read the race report. This is my second year running the 101 Peregrinos Race. Thankfully it went a lot better than last year! I was able to finish the 104 km race in 13 hours and 50 minutes. A lot of thanks goes out to Crystal and Tanzen and their aid station help, Gaspar for finding me on the mountain…again, and Jon for keeping me from quitting in the last 5 kilometers. 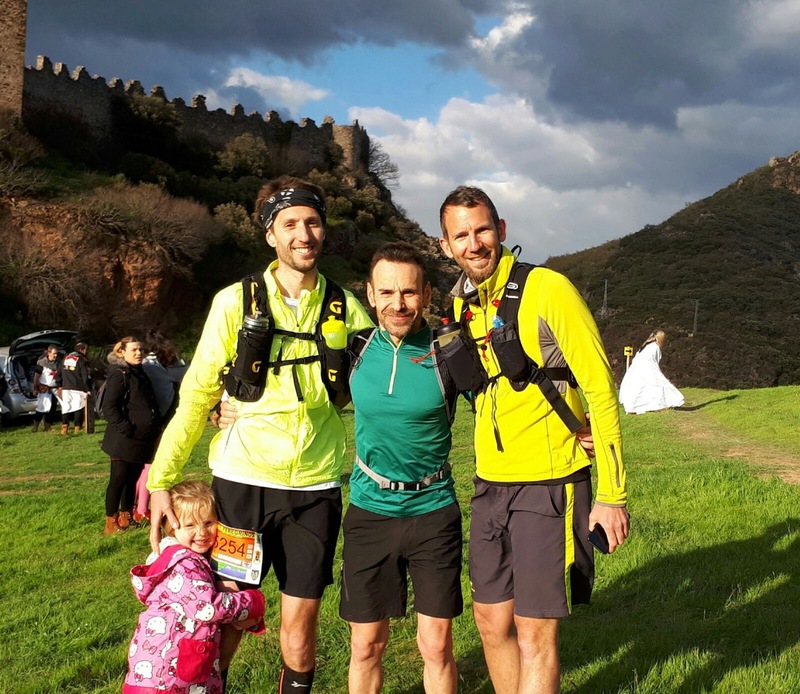 April 29, 2017 I ran the 101 Peregrinos Ultramarathon in El Bierzo. Here is a review of the race. (unless you are a lot faster than me), and pulpo. More about pulpo later. The race is a combination of mountain bikers, 101 km ultra, 48 km marathon, and 101 km team runners. Those biking the route leave in shifts before the runners, and only the fastest runners and the slowest bikers ever see each other. A 9 am race start was a first for me as well. I suppose this counts as “Spanish timing,”and I admit, I enjoyed waking up late! 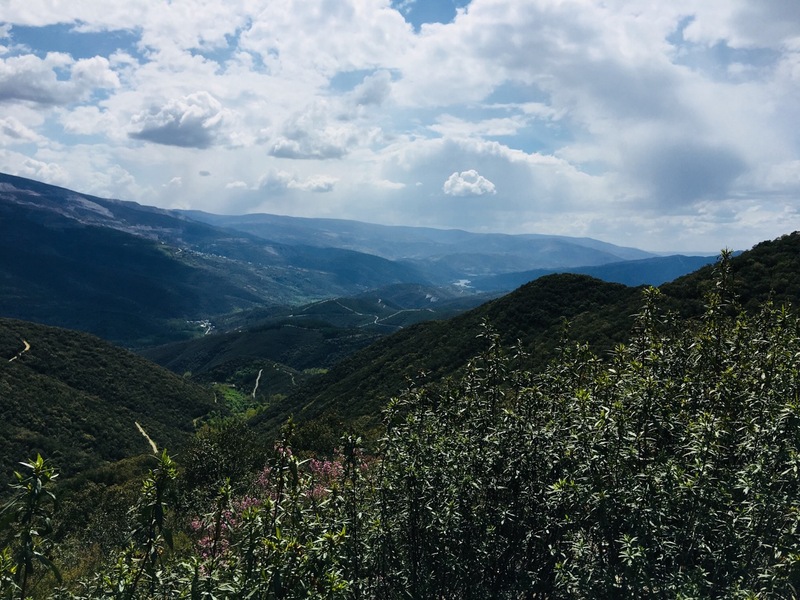 In the first kilometers we passed a 12th century Templar castle, crossed a Roman Bridge, and checked off a section of the Camino de Santiago winter route. 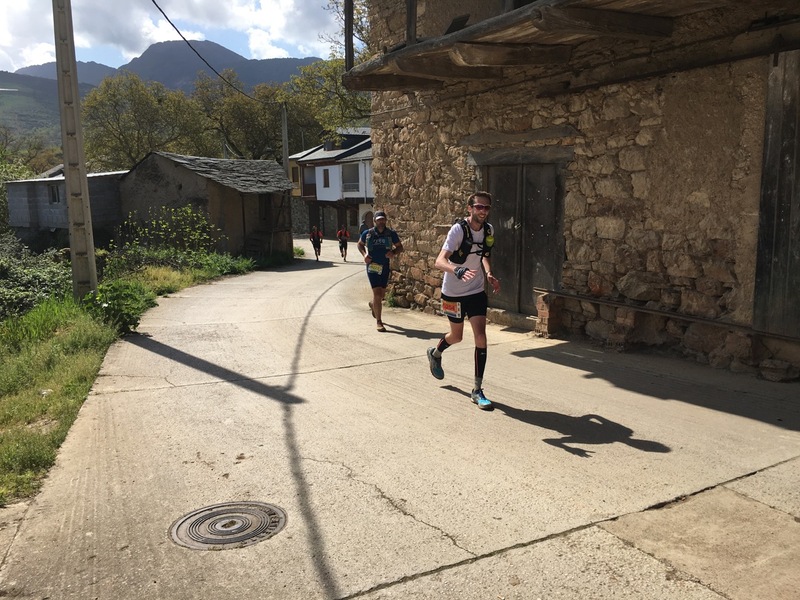 From kilometer 4 to approximately 47 the race winds through the Spanish countryside, over hill and dale…mostly hills and not many dales. Vineyards and forests, little villages and remains of Roman gold mines break up the routine of climbing hills. Somewhere in this segment I managed to add a few extra kilometers (see first two sentences). I have no idea how, but it became glaringly apparent when I skipped an aid station to hit the next one in 3 kilometers. I had run out of water but figured I could fill up my hydration vest at the next one. Three kilometers came and went with no aid station. Then six kilometers passed. The Spanish sun began to do it’s work of drying out every fiber of my being, at least that is what I felt like. I tried to compensate for my thirst by eating whatever I had in my running vest. One. Great. Idea. When I finally did get to the aid station I downed two glasses of Aquarius, a ham and cheese sandwich, and an orange. From this moment on there was something wrong with my stomach. 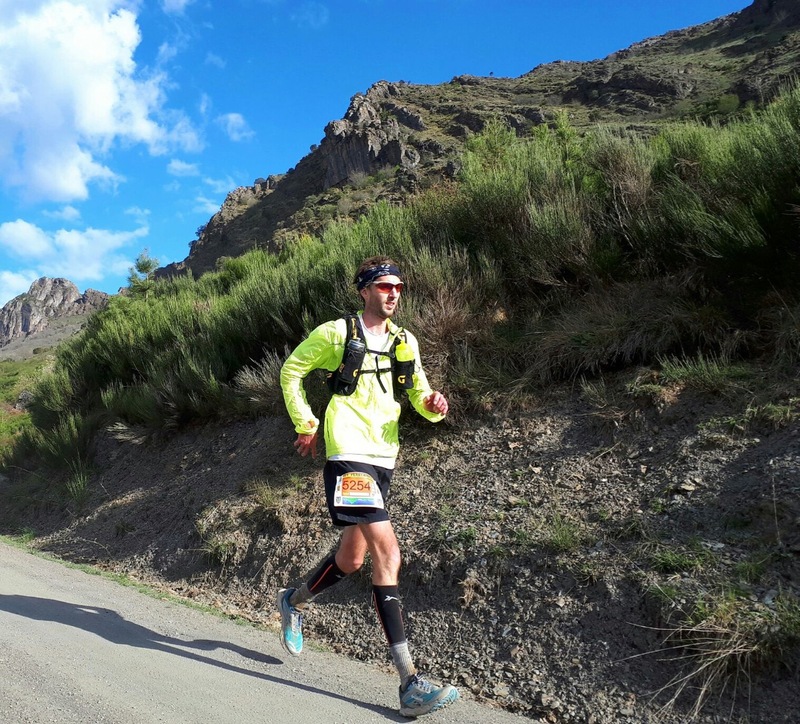 I managed to hit the mid point of the race, Puente de Domingo Florez, maintaining my desired speed to finish in 12 hours, taking into account the horror that was about to come, “horror” meaning the 30 kilometers of consistent elevation gain. Twenty minutes into the upward climb the clouds rolled in, the temperature dropped, and my visions of a quick dip in a mountain stream turned to how to cover my shivering arms. I had left my windbreaker at the bag drop in Puente. Another awesome idea. he would not let me quit in the last two kilometers…what kind of a friend would do that!? While Dad was here we had some great weather for running in the valley. We also were able to participate in a 10k for Proyecto Hombre, a rehabilitation center in our valley where Jon volunteers. Dad took 2nd in his age group and came home with the spoils! Yes. That is Forrest and myself. Yes. That is a video camera. Yes. That is a tv crew. 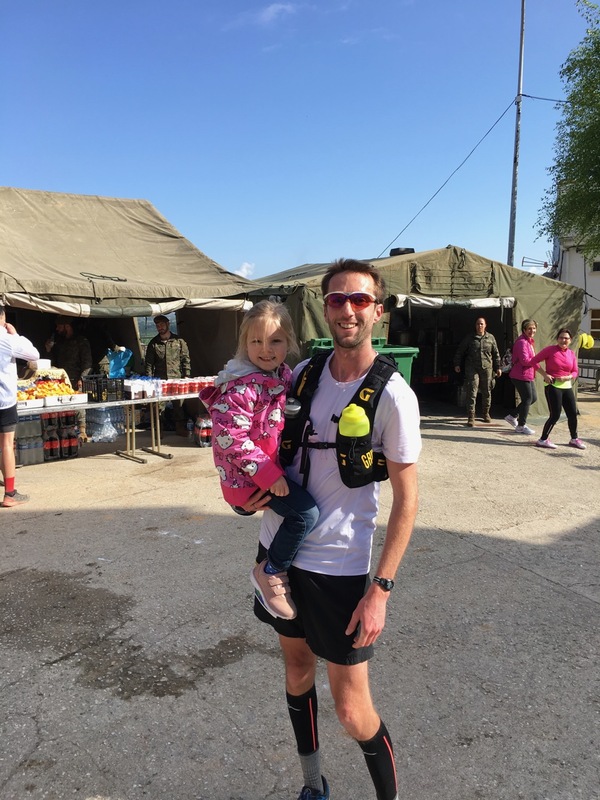 On Saturday we ran our first race here in Spain. It was a race to bring attention to those who have Parkinsons. Gaspar is much faster than we are. Tanzen loves to blow her whistle to “cheer” us on. In can rain very hard in Ponferrada. Make sure to ask beforehand the actual distance of the race. A couple of us look really good in pink. The other one…not so much. How long was it? 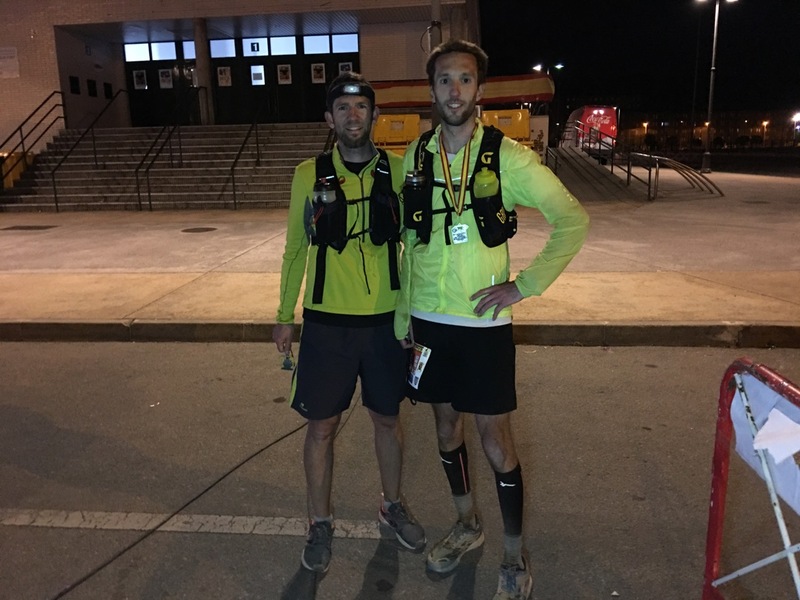 103.3 miles, but it is called a 100 miler. I don’t know why either. Why did you run a race that long? I was in it for the money. Did you win? Yes. A finish is a win. I was the 66th person to win this year. Unfortunately they ran out of all prize money by the time I finished. 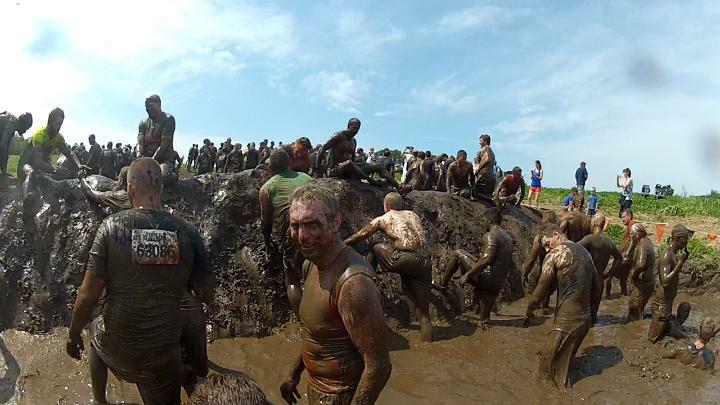 Out of the 250 entrants, only 161 were able to finish. How long did it take you? 32 hours and 50 minutes. We started at 8 am on Friday morning and I ended at 4:50 on Saturday afternoon. The cutoff was 10 pm. What do you get if you finish? I received a metal belt buckle, a customized sweatshirt, a finishers medal, and as many blisters as I could handle. Didn’t it hurt to run over 100 miles? Yes…Yes it did. I have a sibling/parent/cousin/fake relative who has run a marathon. Isn’t this the same thing, only longer? Yes, in the same way that Peewee Herman and Mike Tyson punch the same, but one is just a little bigger. Where was the race held? It was held in the Sawtooth Mountains of the North Shore, following the Superior Hiking Trail from Gooseberry Falls to Lutsen. Did you ever stop? 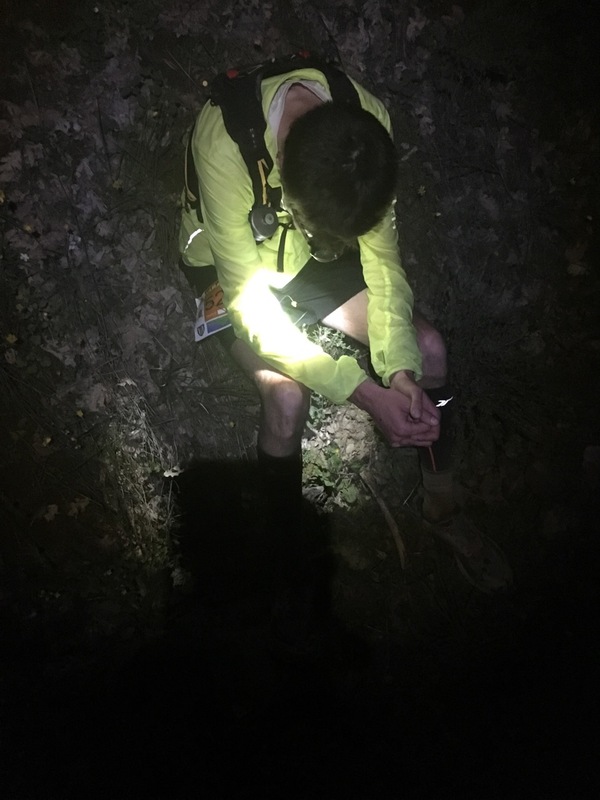 Yes, normally just to curl up and cry by a fire while the aid station attendants tried to figure out how to get me moving again. There were aid stations every 5.5-10 miles. Did you sleep at all? Only once, on accident, while I was running at night. I learned my lesson after stumbling off the trail. Did you run with anyone? I had several running partners. I ran the next 25 miles with different people I met on the trail, sticking with them as long as I could bum snacks or tips off of them. graciously volunteered to run through the night with me, covering the hardest part of the trail while at my lowest emotional state. I think that qualifies him for sainthood, or psychological evaluation. He kept me moving through the middle of the night when I was convinced that I should lay down on the trail and let the wolves have my body. We covered 32 miles from 9 pm to around 11 am. The last 20 miles I had Mark Barrett running behind me. When he wasn’t forcing gels down my throat, he was giving me constant affirmation of my hobbling run and encouragement to pass the next runner. Through his incredible coaching I knocked off over 2 hours from my estimated finish in those last miles. His mantra was, “If you throw this up, we can fill you up again. Take another one.” His promises of steak and the world’s greatest hamburgers lengthened my stride considerably. The final running partners were with me the entire race. 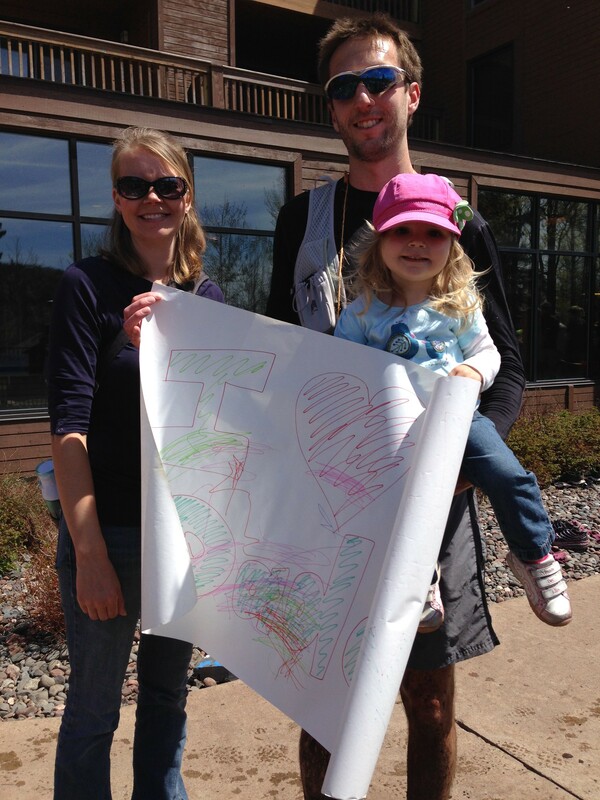 Crystal and Tanzen came to the pre-race meeting, the aid stations, and the finish line. They carried in gear, filled my hydration pack, gave me hugs and kisses, and constantly cheered me on with the shouts and smiles. With them, every aid station is like the finish line when I see them waiting. What do you think of the race? Rugged. Relentless. Remote. A huge thank you to the race director, the many volunteers, and the friends who showed up to run with me, encourage me, and congratulate me at the end. I enjoyed the experience…at least the parts that I haven’t blocked out of my memory. 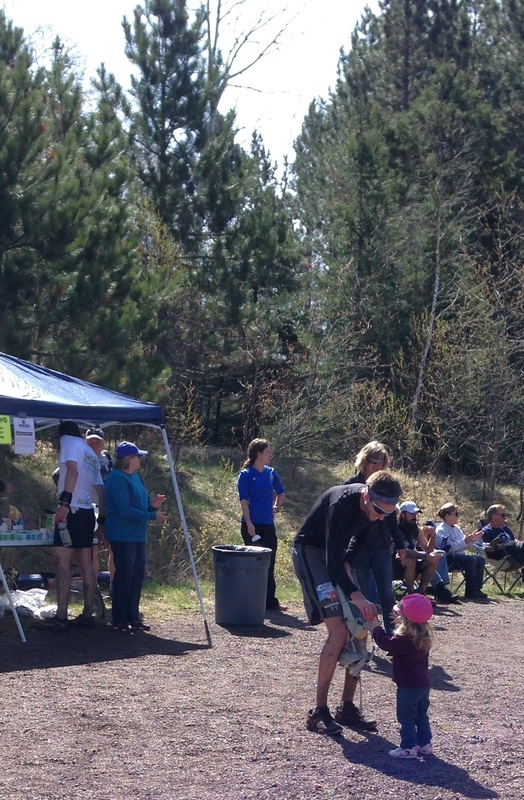 In May we were able to take a quick trip up to Lutsen, MN to see some friends and run a race. 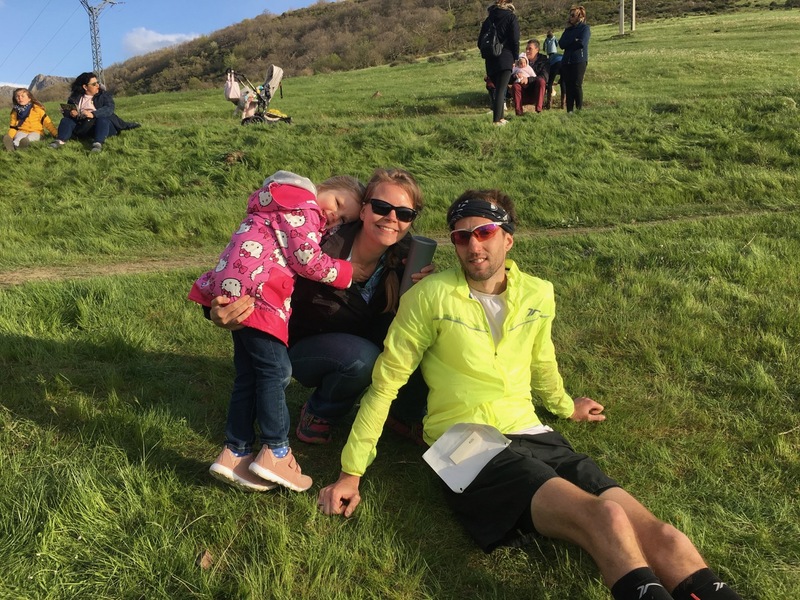 I (Seth) was able to complete the Superior Spring 50k, which was meant to be a qualifying race for another ultra this fall (I ended up qualifying for it before the race, so this was more for the experience). I finished a little faster than my goal which was great, but for me, time is irrelevant in ultras because a finish is a win. This was the first race that both Crystal and Tanzen worked as my support crew. 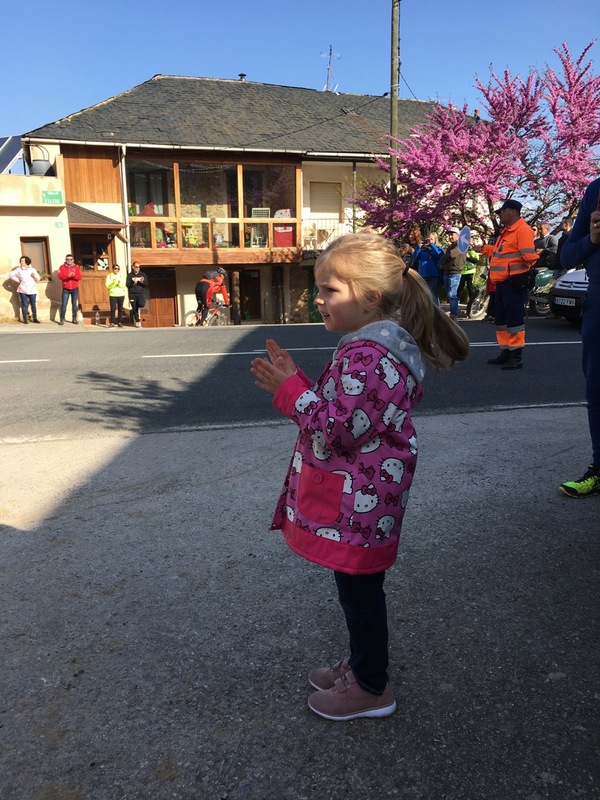 Crystal shuttled the team to the aid stations and Tanzen’s main purpose was to ring a bell she borrowed from another spectator and give me advice on hydration. 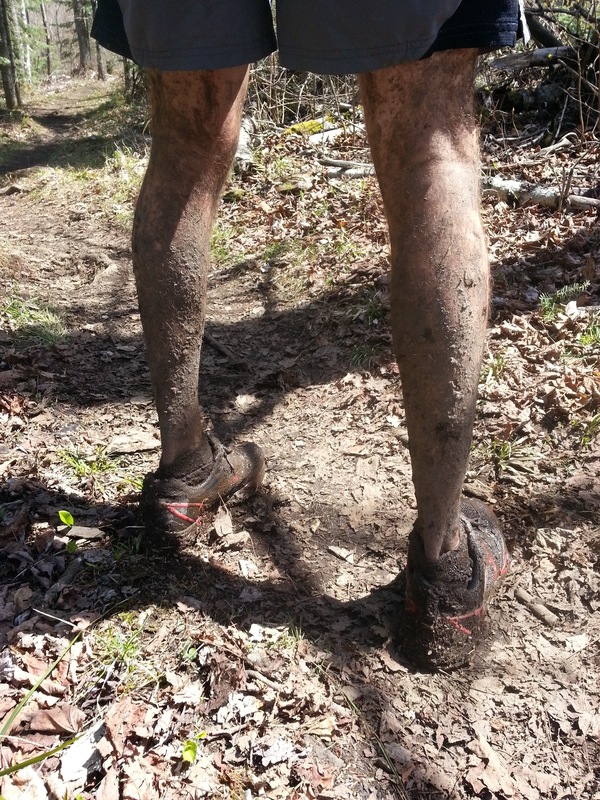 The race was more difficult than I was expecting because of the elevation gain/loss and the mud. I ended up having to strip off my shoes and socks part way through to clear the rocks from inside my socks, and the picture at the bottom shows what I went through the last third of the race. This was one of my most enjoyable races because of the girls being with me! I look forward to the next one. Please notice the progression of the color of our shirts in the pictures. I have been ruminating (never a good sign) on some ideas lately concerning diet and exercise. Strange, I know, since it isn’t even the beginning of the year when everyone is supposed to think about those things, but nevertheless I have been thinking. I don’t think diets or exercise are wrong. Especially if you consider that a diet is just a compilation of what you eat. You can have a good diet or a bad diet. You can eat healthy food in healthy proportions or you can eat unhealthy food in unhealthy proportions (and any mixture of those four). 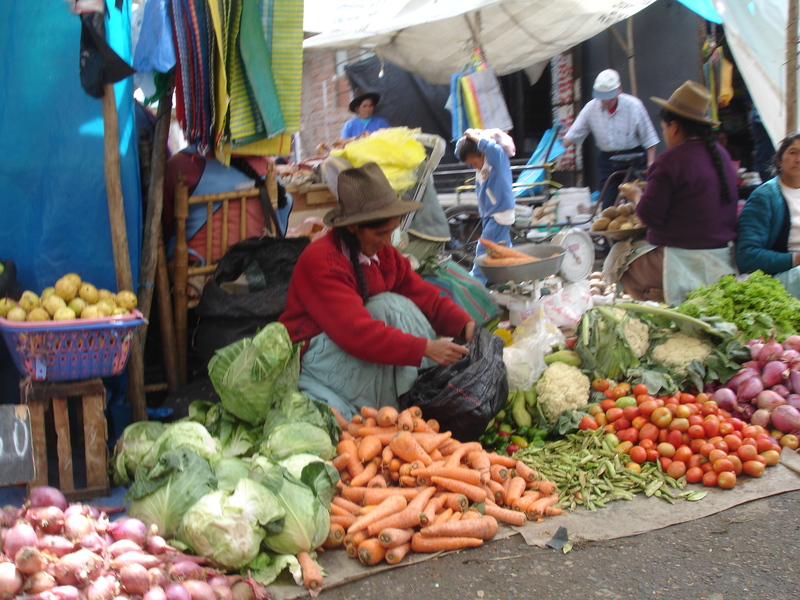 In my mind, when we talk about being healthy, I see “healthy” as not being the end goal. The end goal is being able to do something because you are not healthy. That may be to live, to feel better, to be able to walk, to avoid illness, to avoid surgery, to save money, etc. I would hope that the glory of God in whatever I eat or drink (1 Cor 10:31) is the foundation. However when weight is the issue, that seems like the end goal as well. “I want to be this weight.” Why? Here is a post that started me thinking.